You hopefully read the previous review on the splinter shapes. Well this one is for mottling. For some modelers, mottling can be frustrating, especially if one is a brush painter (and a lot of folks are). 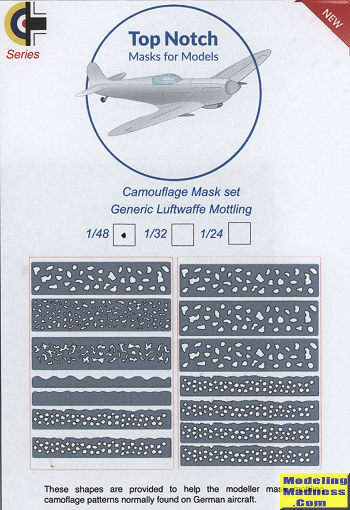 The set provides multiple sizes of mottling and, something I like, a mask for the wavy line leading edges found on some fighters. There are two sheets to a set and you will find multiples of several different mottle sizes. I'll bet these are reusable at least once otherwise it would be difficult to complete a wing leading edge. These could well be used for Italian aircraft as some of their earlier war planes were rather extensively mottled as well. I would show you the actual sheets, but they look like little more than a large rectangle of green-grey vinyl. These sets come in three scales for now; 1/48, 1/32, and 1/24 with the price being different for each one. This set is 1/48 scale and I know it will come in very handy. Check them out at the links below. I should mention that shipping from the UK to the US is no where near as pricey as the other way. Thanks to Top Notch for the review set. This can be found at this link.